"MAINE SPEAKOUT! 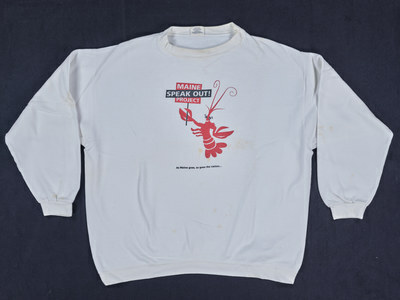 PROJECT As Maine goes, so goes the nation…"
White sweatshirt. Text: [Front] "MAINE SPEAKOUT! PROJECT As Maine goes, so goes the nation…" [Back] "As Maine goes, so goes the nation… SPEAK OUT!" Maine Speakout! Project, ""MAINE SPEAKOUT! PROJECT As Maine goes, so goes the nation…"" (2016). T-Shirts. 225.